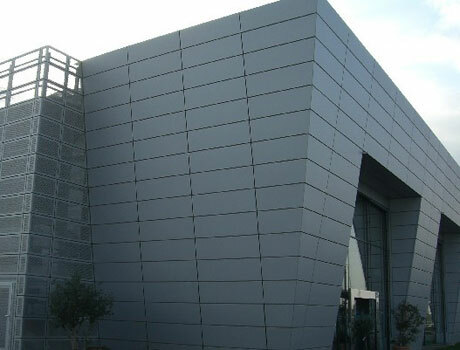 Industrial warehouses covering with aluminium panels made of perforated metal sheets. The lightness of the material is enhanced by the expanding procedure: it creates empty and full spaces without weakening its powerful structure. Sturdiness is also guaranteed by the veining of the net during the mesh-expanding procedure. Meshes are directed at a 45° angle, increasing the initial thickness of the panel significantly.